A new system of heavy goods transport on common roads. 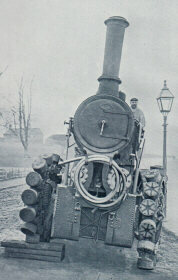 Diplock was concerned with the development of traction engines. In 1893 he took out a patent for a four-wheel drive engine, reported on at length by Colonel R.E.Crampton in a series of letters reproduced here. Crampton also went to see several tests performed by the patent engine as built and was sufficiently impressed to recommend the building of a second engine. This engine, apart from incorporating improvements to the original engine, also incorporated Diplock’s other major invention, the "Pedrail". This was intended to overcome damage to the road surface by placing on each wheel a series of "feet", set into a ball-and-socket joint and provided with springs. This second engine was inspected by H.S.Hele-Shaw, whose reports are also included here. Diplock’s book describes both engines in detail, giving the reasons behind his design decisions and showing how the system might be extended to rolling stock. 8vo. (viii) + 116pp, 2 photo plts and some text ills. Publisher’s cloth. Ownership inscription of Leonard B.Diplock.